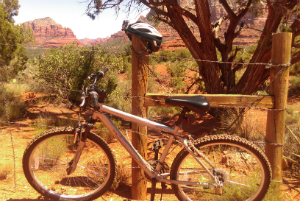 This is part of a series consisting of excerpts from a journal I keep reflecting on loss, healing, change, and other adventures, usually during the few summer weeks I spend in Sedona, AZ. This one features a Video below, as well as links to the series’ Lead Post and to Emmanuel House. I’ve titled this series of journal excerpts “Climbing Bryan’s Mountain,” but as I explained in the 2012 journal excerpts, it’s become a process of biking the mountain as much as going up by foot. This summer I borrowed a Go-Pro from the Frank Lloyd Wright Trust (where my wife works), strapped it on my bike helmet, and recorded some footage over two days. I left out most of the uphill journey—a tiring, 25-minute or so slog—and focused more on the return: an exhilarating 6 minutes downhill. The result is the VIDEO BELOW. In my narration I address the folks at the Frank Lloyd Wright Trust so they know what I’m doing with their gear, and about 50 seconds in I talk about the main object of my climb: a tree about 1/3 the way up a mountain the world knows as Bell Rock. Soon after Bryan Emmanuel Guzman died, we placed some of his ashes under that small pine and since then have called Bell Rock “Bryan’s Mountain.” Also, soon after Bryan’s death his oldest brother Rick, and his wife Desiree, started a foundation called Emmanuel House as a living memorial. I spend a few seconds telling about all this, but then the video below switches quickly back to biking and me zooming back down to the Village of Oak Creek, one of four areas making up the town of Sedona, Arizona. Enjoy! ♦ Read Part 1 of the 2016 journal excerpts. ♦ Go to the Lead Post in the Climbing Bryan’s Mountain series. This entry was posted in Family, Music & Media Podcasts and tagged Bell Rock, Bryan Emmanuel Guzman, Emmanuel House, Rick Guzman, Sedona. Bookmark the permalink.